Multifunction reliable and simple in management: are used in operating rooms, intensive care units, cardiology and a heart surgery, in ambulance aircraft and ambulance cars. The TES-8300K series with multiconnectors allows to measure at the same time an ECG, SpO2, SO2, IAD, NIAD, temperature. The unique analysis algorithm of arrhythmias "es1" helps to improve monitoring of patients. TES-8300K offers the intuitive and convenient AED function and external cardiostimulation in case of unexpected changes of a condition of the patient. The reliable bi-phase technology - thanks to the unique NIHON KOHDEN ActiBiphasic® technology a defibrillation does smaller harm to a myocardium. 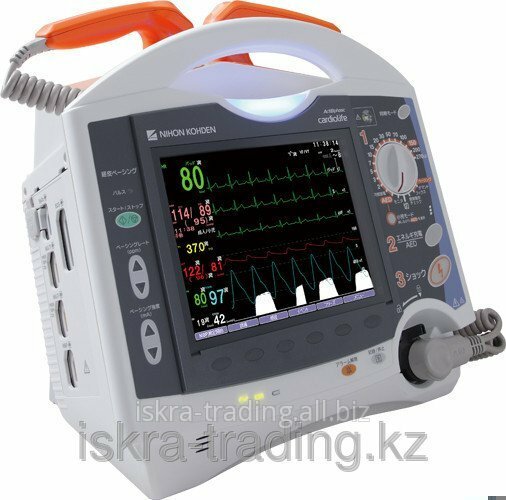 Unbelievable price on Cardio Life TEC-8300 series defibrillators in Almaty (Kazakhstan) company Iskra trejding, TOO.